Network X: Why did you start the radio show Mind Over Matters? Jay Weidner: When I was young I dreamed of being an investigative journalist, like Woodward and Bernstein. From a very young age I have always been interested in finding out what was happening behind the scenes. This was true both in a political sense and also in a metaphysical sense. So I structured the program to reflect these diverse interests. On Saturdays I would broadcast interviews and shows concerned with what Peter Dale Scott would call ‘Deep Politics’. This would include people like Noam Chomsky, Michael Parenti, David Barsamian and others. On Sundays I would concentrate on the mysteries of the esoteric. This would include people like Terence McKenna, Joseph Campbell, Alan Watts etc. The show was a potpourri of people who challenged the established view on worldly matters. It was also about how we can take control of these situations if we so desire. Hence the title ‘Mind Over Matters’. I’m proud to say that the show is still on the air in Seattle. Network X: You presented a daring program. Most of us had never heard of many of the topics that you presented. Jay Weidner: That’s true. MOM (Mind Over Matters) was the first program of any kind that began talking about the World Trade Commission and the Free Trade acts that were being tossed around and finally, later, made into law. Every week I pounded away at the illegitimacy of these new laws and how they would lead to a New World Order. I was called a kook by a local newspaper and several groups attempted to have me thrown off the air, which they eventually succeeded in doing. I am proud to have done my share to provoke some discussion on these dangerous and powerful men that seek to guide our future. This is not to say that I am against a world government. I think some form of elderly and wise advice from a world commission is a great idea. The French hermeticist Schwaller de Lubicz once advocated this type of world government. But instead of this we have a group of corporate bandits in charge now. And they don’t give a damn about us. Mind Over Matters was a great show and a great experience. I met many wonderful people and it hopefully changed the way that the listener viewed their world. Network X: You got into a lot of trouble over some of the shows you presented. I did. After I went on the air an entire spectrum of odd events began occuring to me. I didn’t realize how many buttons I had pushed. I think the one program that got me in the most trouble was when we went out in search of VOTESCAM. I tried to get the software code that they used to program the local Seattle election machines. I was told by the company that owns the software that getting a copy of the code would not be possible. I then discovered that the entire election process was presided over by the same private corporation that controlled the software code. As the 1994 election approached I began to become more active in watching the vote and how it was tallied. My life was threatened a number of times during this period. I had University of Washington Journalism students ready to watch the polling areas for suspicious activity. For instance I wanted to know exactly how ‘exit polling’ was accomplished. When considered it doesn’t make any sense. In 1992 we had watched the election on TV and we noticed that the exit polls, which were released a little after the polls closed at 8pm, were almost exactly right. The exit polls had Clinton beating Bush (senior) in the same exact percentages as the actual ballot. Now how did they do this? Presumably an exit poller would have to have some kind of scientific method to have their figures come out so close to the real figures. Did they get the right number of blacks, Jews, Catholics, Irish, and Latinos? How did they do it? That became the question as we approached the 1994 election. I went on the radio and asked for people to call up if they had ever been exit polled as they left the booth. Hardly anyone had ever been polled. I know I never have. So we vowed to report exactly what might happen on election night. As this thing heated up, the pressure on me increased. The threats on my life also increased. I was getting weird phone calls in the middle of the night from people who just breathed into the other end of the line. My manager at the radio station had quit because of illness and the new guy did not like me at all. I knew my days on the air were numbered. I was fired in August 1994 and never had the chance to report what happened on the election night of November of that same year. What did happen is even more interesting. For the first time in memory there were no exit polls done on that election is Seattle. They waited until about 10PM to call the elections. Very interesting. Network X: Tell us about Mae Brussel. Jay Weidner: Mae was really my main inspiration for the political side of the show. There will never again be a researcher like her. I remember I first heard her in 1984 while driving through Carmel, California. I had the radio on in my car and I came upon one of her live programs. I had to pull the car over to the side of the highway just to listen to her. It was absolutely amazing. She was connecting all of the men who would later be involved in the Iran/Contra scandal to an entire series of other political shenanigans. ‘Fun and games’ as they are called by the agencies. In a manner that overwhelmed me, I listened to Mae link obscure political figures with great events. She was audacious, mind blowing and reality expanding. I shuddered for a good ten minutes after hearing that show. I vowed I would find out all about this woman. So I ordered a bag full of her audiotapes and began to listen to them, take notes and see if she was right. I have to say that, in the end, Mae was right far more than she was wrong. She gets more right actually as time goes on. There are a couple of people like Dave Emory and John Judge who carry on her work but for the most part there is no one who is doing today what Mae was doing in the 70’s and 80’s. She died in 1986 and that was the end of a great era in radio broadcasting. I tried to carry her work on with Mind Over Matters but the pressures were enormous. I was taken to task repeatedly by the managers of the station, and by others. I was worried for my life in fact. Strange men were parked in cars in front of my house. It was utterly unnerving how much commotion began when I started that show. Within six months of going on the air the radio station itself was consumed by an internal strike. The volunteers didn’t like the way the station was headed and they walked out in protest. They wanted me to follow but that would have meant abandoning Mind Over Matters. Besides I never understood what they were striking against. So I chose to stay with it. I have often wondered since then if that strike wasn’t a COINTELPRO operation. I had known for a long time that the agencies had infiltrated various left wing, and right wing, political organizations. It didn’t seem like a great leap to suppose that the same infiltrated political organizations had suddenly decided that the station wasn’t following the ‘politically correct’ path and so they created a strike that actually, in the end, got me fired and caused the complete ruin of the radio station, which up until that time had been one of the most radical and adventurous radio stations in the entire country. The caveat to this story is that the day after I was fired this group of ‘strikers’ called off the strike for no apparent reason. Almost two years of their fierce struggle against the station virtually disappeared overnight. It is only now that I am realizing that it was not the station manager that they were protesting against – it was Mind Over Matters and me that was worrying somebody. The show has now floundered into a left wing politically correct presentation. Not nearly as interesting as what was going on before.. Mind Over Matters, when I was the Producer and the Host, attempted to raise the intellectual level up a notch, moving from a few common political causes to reveal that there is a plan to create a world government ruled by corporations. If we are to have world government than we should also have a say in it. But we don’t. We don’t even know the names of the men and women on the committees who are on the World Trade Commission. It isn’t even a form of representational democracy. We have to ask ourselves the question: why do they keep everything so secret? If the conspiracy theorists are so wrong than why doesn’t the government just tell us the truth. Why hold the JFK stuff until the middle of the 21st century? Why hide what happened with the cocaine trade in the 1980’s? Why hide the real reasons behind the Gulf War? When they quit hiding everything the conspiracy theorists will go away. Network X: So now that you are away from the rigors of doing a six-hour radio show, what are doing? Jay Weidner: While I love radio, my real interest is alchemy. I know that sounds odd but I have always been interested in alchemy and in particular and alchemist named Fulcanelli. Politics is a just a side show to what is really happening in the world. Alchemy has opened me up to the perception that this world is really just a gigantic shell game. But there is a mystery underneath it all. I think that Mae Brussel and Peter Dale Scott and Noam Chomsky all have a small piece of this greater mystery. Alchemy is one of the ways that I am attempting to uncover this mystery. So right now I am writing a book about a cross in the south of France. The project is daunting in scope as it will attempt to follow this mystery all the way back to Egypt and maybe even Peru. I need a lot of help, both financially and in doing the research. Network X: Can you tell us more about this? Jay Weidner: Not really. I have received some financial backing for this vein of research and it promises to be something very exciting and profound. It is really about the secret of time, also of history and who we really are as a race. This cross is the most important monument in the world so I have to be careful about what I say. I mean I have already had a concerted COINTELPRO operation directed at me because of what we reported on Mind Over Matters – I don’t need another one. Therefore, until I release the findings sometime in the future I am staying quiet about this one. Network X: Aren’t you making a documentary also? Jay Weidner: Yes. Besides radio and alchemy I really like making films. I made a feature film in 1980 and have had the desire to get back to directing again. Right now I am in the middle of making a film about NASA. This is a story that just gets weirder and weirder. When I started out last year writing and researching the script, I believed that NASA was a government agency that actually had done something useful with our tax money. But the more I examined the evidence they presented me the more damning it all became. Now, as I am starting pre production, I am completely rethinking the project. Network X: This film was originally concerned with the Apollo program? Jay Weidner: That was the initial reason for producing the film. I had this grandiose idea that I would get a lot of great film from NASA and use it as filler over interviews with the astronauts. But getting the sixteen-millimeter film of the Apollo missions from NASA has proven to be incredibly difficult. In 2 years I have only received one reel and this is of Apollo 10, which didn’t even land on the moon. Even in that reel there is enough high weirdness to make anyone sit up and notice. And none of the astronauts will do an interview. Isn’t that strange? Network X: Are you saying that they didn’t go to the moon? Jay Weidner: No, not that. I am saying that something else, far weirder is happening. 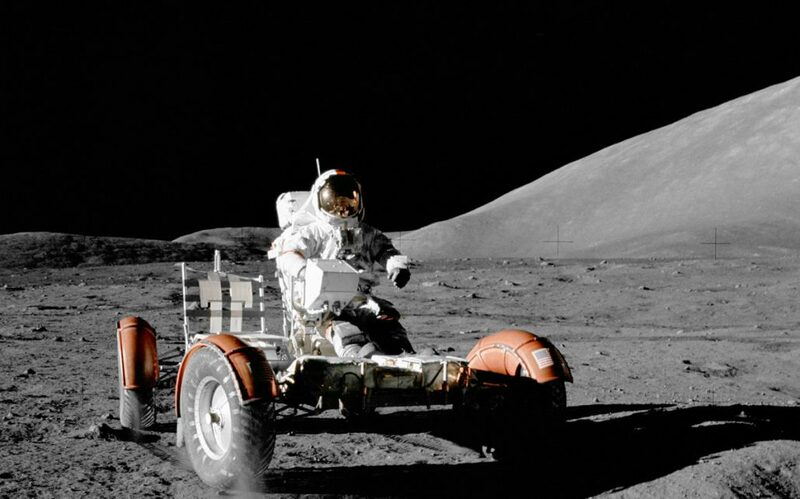 NASA has discovered artifacts both on the moon and on Mars. I don’t think they know how to tell us that there is stuff all over the place. There’s a guy up north of here in Bellingham that has taken NASA Apollo photographs of one of the low fly by of the moon. He has blown them up into huge prints. An examination of these prints reveals all sorts of odd objects and fractal patterns all over the surface of the moon. All I can definitely say is that there are some very artificial things up on the moon and on Mars. And NASA really doesn’t know how to tell us. They aren’t covering it up so much as they don’t know how to say it. Did you ever see Kubrick’s 2001? There’s a scene in there where NASA decides to hide the discovery of the monolith from the rest of humanity. Kubrick was telling us with that movie and know one seems to get it. I think Kubrick knew a lot more than he was saying. Network X: When is your film going to be finished? Jay Weidner: I don’t know. I have lost control of the subject matter. Everything I find concerning NASA is so weird that the film would have to be five hours long now to make any sense. We will see. Network X: What is you association with Richard Hoagland? Jay Weidner: We have an off again, on again, kind of thing happening. Right now we are off. Richard’s done a lot of good. I know people criticize him for some of his behavior. While I share those concerns I think that Richard has helped to uncover a lot concerning NASA. I think he has done a lot of good work and he also has made some huge mistakes. But that happens to everyone who climbs out on a limb like he does. Whatever one wants to say about Richard he is courageous. Perhaps a little foolhardy also. I think Richard is torn between evidence that is real and evidence that is hoaxed. That’s the real concern here. There is really evidence of three different things with NASA. One is a hoax, another is hiding strange structures and, lastly, just pure sloppiness on the part of NASA. Their history of how they treat the photographs and motion picture film from the Apollo program, and even missions before that, is outrageous. I think I can say that some of this sloppiness is intentional on their part. The layer of sloppy record keeping and archival loss is beyond the boundaries of what is appropriate. After a while one can only come away with the feeling that the sloppiness is part of an attempt to obfuscate the truth. Network X: What about your associations with Terence McKenna? Jay Weidner: I wouldn’t call myself a friend of Terence but I am a supporter of some of the things that he says. Terence, like Richard, has certain behavior problems that cause him a lot of trouble. But again Terence is climbing way out on the branch. Of course he’s going to be perceived as eccentric. He is eccentric! But Terence’s work on psychedelic alchemy is sound and persuasive. I think he is right about psychedelics. They do have this ability to reveal the invisible landscape that surrounds us. Terence is also correct in his analysis of DMT molecules and their equation with those of certain brain chemistries like seratonin and melatonin, which are emitted from the pineal gland. Do I agree with everything that Terence says? No absolutely not. I have taken DMT and it is incredibly interesting but also very dangerous. DMT in the wrong hands could be a very scary thing. I must have had Terence on the radio show about a hundred times. The listeners loved him. The station manager hated him. But then they hated Noam Chomsky, Jean Houston, Graham Hancock, Peter Dale Scott, and all the rest of the people I interviewed. Network X: Any plans for going back on the air? Jay Weidner: No. I want to turn my attention towards writing my book on alchemy and making films. Right now these are the only things that interest me. Network X: Thank you very much. Jay Weidner: Thanks for having me.